Welcome to the Monday Morning Mechanic! This website is here to help you make the right choices when it comes to choosing a repair facility…so that you never find yourself in this situation! You’ll find everything you might need to know about auto repair, from daily car care tips, to archives of shows you may have missed, to shops I’d recommend to my own grandmother! 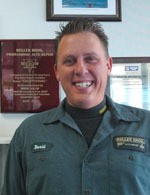 Have a Question for the Monday Morning Mechanic? Send me your questions or concerns anytime over on the Contact page! I’m happy to help!